Let's talk penalties. Real Madrid have conceded a penalty in the 3 of their last 4 Champions League matches. They also conceded one in last year's final which was missed by Antoine Griezmann. If they give one away to Juventus their designated taker of spot kicks is 23 year old Paulo Dybala who is excellent from the spot. +900 is worth a sprinkle. If Real Madrid get a penalty we all know who will be taking it. However, Cristiano Ronaldo has mixed results from the penalty spot. It feels like if you gave him 25 chances he would miss 7 or 8. So +2500 is a fantastic value. If you want to take either team to win the game on penalties you can get +1000 at BET365 as oppose to +800 at William Hill so take the extra 25%. Juventus have trailed for less than 40 minutes in this entire competition, so for them to come from behind and win would be difficult seeing as how they hardly trail. But Real Madrid, as a function of how they play, could very easily fall behind and have to claw their way back. Doing it against a Juventus team that has only allowed 3 goals in 1,080 minutes of football is another thing altogether but after what we have seen from the Galacticos in this competition over the past three seasons, how can you say anything is beyond them? In 6 knockout stage games, Real have trailed at some point in 5 of those contests. They came back and won three of those in 90 minutes and a fourth in 120 minutes. When they won La Decima four seasons ago they needed a last second equalizer by Sergio Ramos, a goal which altered how history will view this collective. Comebacks are built into this squad's DNA. So whom should you take to score on Saturday and who should you avoid? Real Madrid conceded goals and the one player for the Old Lady who seems to pop up in these big clashes is the aforementioned Paulo Dybala. Take him to score anytime at +220 on WilliamHill. With the final being held in the home nation of Gareth Bale one might fall for the fairy tale but I would avoid taking the Welshman at +280. Frankly I'm not sure if he'll even be on the field for half an hour, and if you are taking a bet like this on any player you should be sure he's starting and playing close to 90 minutes. Of the 3 goals that Juventus has conceded in this competition 2 have come from set piece situations. Toni Kroos who is excellent from deadball spots adds extra value not only on Cristiano Ronaldo but also the aforementioned Sergio Ramos who has a knack for scoring huge goals on the biggest stage. 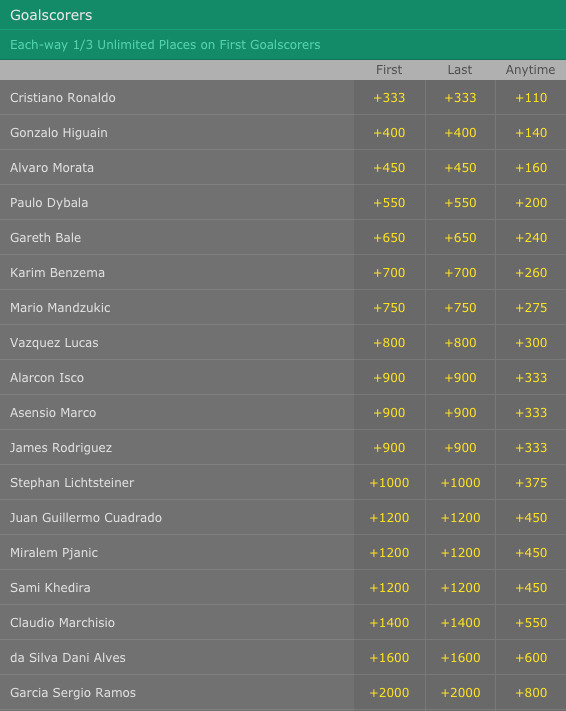 You can bet on the captain to score anytime at +800 on Bet365.